The non-surgical rhinoplasty procedure uses injectable fillers instead of surgery to alter the shape of the nose. This procedure involves filling the depressed areas of the nose and smoothing out bumps on the nose’s bridge. Non-surgical rhinoplasty is considered a cosmetic procedure, and as such is not used to correct nasal breathing difficulties and other functional problems of the nasal structure. As one of the face’s main features, the nose is an important element that can contribute to a well-balanced, aesthetically pleasing look. Non-surgical rhinoplasty is an effective, non-surgical alternative for St. Petersburg, FL patients who wish to create a more balanced-looking face by changing the nose’s shape, but who don’t wish to undergo an invasive surgery. 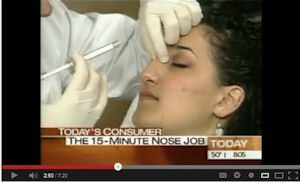 Although mainly used for cosmetic enhancement, non-surgical rhinoplasty can also be used to treat certain birth defects. And since the procedure is minimally invasive, there is significantly less bruising and swelling than traditional rhinoplasty. Non-surgical rhinoplasty, though it cannot be used to reduce nose size, can give the nose a straighter look, which often makes it appear smaller as well. The procedure is most frequently used to increase nose height and provide more definition to the nasal bridge and other areas. As with other cosmetic procedures, possible complications of the procedure can include infection, hematoma, discomfort, anatomic asymmetry, or foreign body reaction (called granulomas). Granulomas are extremely rare, and are most seen with impure silicone and some of the early non-modern versions of methyl-methacrylate. Patients near St. Petersburg, Clearwater or Tampa, FL can schedule a quick and easy non-surgical nose job by visiting our contact page or by calling our office directly at (727) 522-3223.